Simulating a real world environment is of utmost importance for achieving accurate and meaningful results in experimental economics. Offering monetary incentives is a common method of creating this environment. In general, experimenters provide the rewards at the time of experiment. In this paper, we argue that receiving the reward at the time of the experiment may lead participants to make decisions as if the money they are using were not their own. To solve this problem, we devised a “prepaid mechanism” that encourages participants to use the money as if it were their own. The online version of this article (doi: 10.1007/s10683-011-9294-4) contains supplementary material, which is available to authorized users. Fiore, A. (2009). 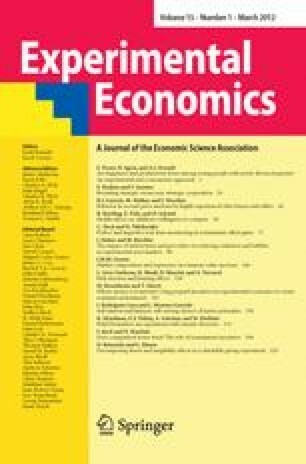 Experimental economics: some methodological notes. MPRA Paper No. 12498. http://mpra.ub.uni-muenchen.de/12498/. Accessed 19 June 2011.